Hallowe’en always brings out witches, vampires, ghosts… and hobos. 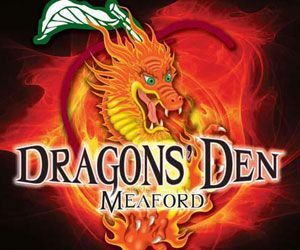 But in Meaford it also brings out the Dragons. Wednesday night’s Dragons’ Den Meaford kicked off with a video introduction by Peter Mansbridge, before the five business leaders took the stage in preparation to “grill” the contestants. Lynne’s concept of helping retirees and seniors downsize and move, as well as coordinate estate sales, real estate home staging, and home repairs, met with interest from the Dragons. While not forthcoming with funding for her business, they offered advice and encouraged her to refine and sharpen her plan. Eric is currently providing 3D printing services to clients across North America and around the world, creating short-run parts using his high-end technology. An early entrant in what promises to become a big industry, Eric also received some sound advice, as well as $500 in funding from the Dragons. A previous entrant in Dragons’ Den, Bill is now looking to expand his independent living and aging-at-home services with a new service technology called Care-Link Advantage, which goes beyond current emergency alert transmitters to help seniors live at home safely. Bill received $600 from the Dragons. The leather-craftin’ cowboy strode in to pitch his startup, a custom hand-made leather shop which focuses on recycling and refurbishing heritage leather. The Dragons were impressed, and rewarded Daniel with $2,650 and $4,435 in business services. After just two years in operation, Canada’s youngest brewmaster has increased sales dramatically and is on his way to expand into even more LCBO stores in the province. His passion and early success led him to take the grand prize from the Dragons ($4,000 and $16,125 in business services), as well as the Audience Choice Award, for another $1,555 in cash and prizes. When night falls, if you dare, venture down the road to where the dark mountain looms over the shadowy streets of the village below. There, meet your guide and set forth on a journey through the rustling forest and the crooked village byways, crackling through the dry leaves on the treacherous trails of Haunted Hill. The “Hike on Haunted Hill”, an unsettling production of Theatre Collingwood and Collingwood Collegiate Institute’s Drama Club, invites you to brave whatever dark things may be lurking in Blue Mountain Village and the surrounding hills – in a frightening and fun seasonal adventure. The hikes take place on Friday and Saturday, with nightly embarkations at 7 p.m. and 9 p.m. There’s even a daytime hike, that might better suit young’uns or those less stout of heart, at 3 p.m. on Saturday. Tickets are $15 for adults, $10 for youths age 6-12, and kids five and under get in free when accompanied by an adult. 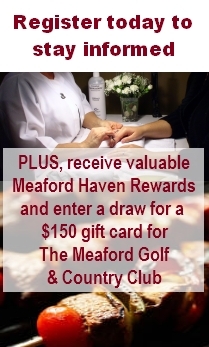 Get your tickets by calling 705.443.5522 or in person at the Activity Central Building in Blue Mountain Village. The Haunted Hike is just part of the family-friendly frights at Blue Mountain this weekend. The Cascade Putting Course, excuse me, the Haunted Graveyard Putting Course, is open after dark. And there’s even more. 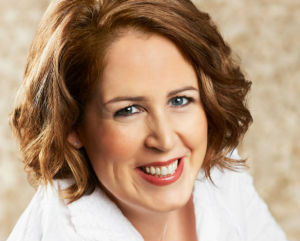 October is Canadian Library Month, and the Meaford Public Library and the Blue Mountains Public Library have joined forces to bring #1 New York Times bestselling author Kelley Armstrong to Meaford Hall next Tuesday, October 21. Armstrong is the author of the Otherworld series and the Darkest Powers and Darkness Rising trilogies, as well as other popular teen and adult supernatural series. Otherworld has been made into Bitten, a hit television showon the Space Channel. At Meaford Hall, she’ll read from her work and answer questions about her novels. The 1 p.m. event is free; just drop by either library to pick up your ticket. As Meaford itself becomes a vibrant display of autumn foliage, the Meaford Creative Arts Association (MCAA) displays work by all of its members at the annual Changing Colours art show and sale at Meaford Hall. From now through November 16, you can view – and purchase (well in time for Christmas) – paintings, pottery, jewellery and fabric art by dozens of local artists and artisans. This year, look for a new addition: “miniature paintings”, highly detailed works perfect for small spaces. The show, in the Hall Galleries, is free to visit. The MCAA, launched in 2002, brings together local artists working in a variety of media. The group organizes juried art exhibits and sales, a summer youth art camp, and was behind a project to turn ceiling tiles at the Meaford Hospital into works of art, providing welcome colour and beauty for patients. If you’re interested in joining the MCAA, call Judy Shield at 519.599.3817, or drop by the Terrace Room at Meaford Hall any Monday between 9 a.m. and 4 p.m. The group meets there weekly to paint and participate in workshops and discussions, heading outside in July and August to sketch or paint en plein air. 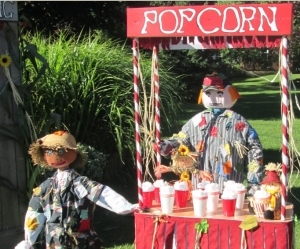 Fall colors, scarecrows on parade, and one of Ontario’s most popular craft shows. Meaford welcomes Autumn this weekend with all of the above. At 10 a.m. tomorrow, the annual Apple Harvest Craft Show opens at the Meaford Arena and Meaford Curling Club. This juried craft show features close to 200 artisans from Ontario and beyond. And the blaze of autumn foliage has just begun in the last week or so, heralding fall and apple season.